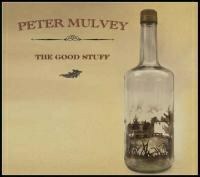 Folk veteran Peter Mulvey provides another batch of bluesy tunes with his latest release, The Good Stuff. Peter Mulvey knows how to make good bluesy-folk music. The Milwaukee, Wisconsin, singer and songwriter has been doing it for two decades, and just when you think there’s no ground left to cover, Mulvey brings another fresh take to the folk genre. With a discography as long as Mulvey’s, you’re sure to find some hit and miss releases, but the man has enough talent that even when an album falters as a whole, there are enough surprises and enjoyable moments that it’s easy to forget any missteps. Such is the case with The Good Stuff, Mulvey’s latest release. The Good Stuff is about as eclectic as you could expect a folk album of this nature to be, encompassing the best parts of Mulvey’s past work while still showing off some new tricks. Songs like “Sad and Blue”, “Are You Sure?” and “Ruby, My Dear” show off his bluesy guitar abilities while the drums and fiddle on “Time to Spend” pick up the pace and lighten the mood. Meanwhile, “I Don’t Know Why, But I Do” and “High Noon” fall somewhere between the two styles and showcase Mulvey’s voice, which seems to suit the feel of the songs quite well. A couple of treats come in the form of instrumental track “Egg Radio” and Mulvey’s interesting rendition of “Mood Indigo”. While a few of the tracks on The Good Stuff feel a bit tired and re-hashed, the album as a whole is quite pleasing and captures the essence of folk music in true form. Mulvey’s skills, both as singer/songwriter and as a musician, were made to suit this style, thus giving him the freedom to continue his craft as long as he sees fit.